Keeping warm! | Nicki Kinickie Nicki Kinickie: Keeping warm! I just had to share this cute pic with you all on this icy, snowy Monday morning. 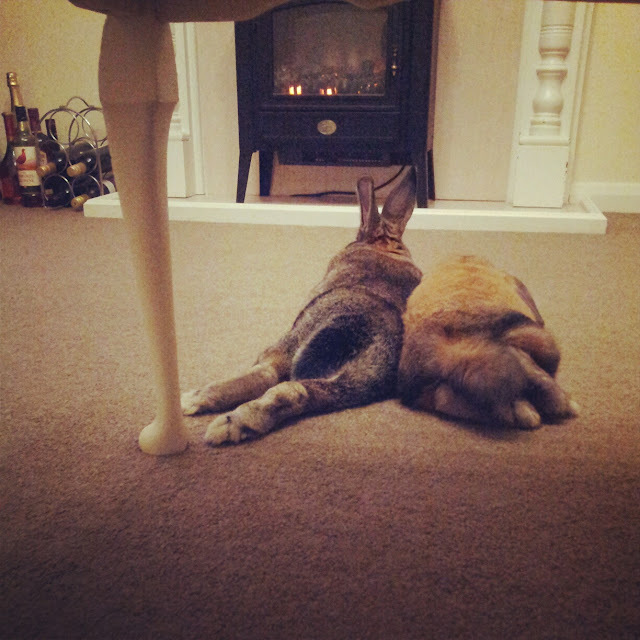 Earlier the bunnies lay down in front of the fire to cuddle up and warm their little tootsies after a cold night. They don't normally pay attention to the fire as they are not fans of the heat but obviously on this occassion they felt it was needed!!! I don't blame them, it is freezing this morning!! Hope everyone has a safe journey into work. Oh hello you gorgeous pair! Bunny bottoms are ridiculously cute and seeing a flopped out happy bunny is the best. I agree their bottoms ARE cute! Im always squeezing them :) haha!! Aw what a gorgeous pair! :D In loe.